Our school club for Peace Fur Paws just began this year at Westmount Collegiate Institute by one of our key Founders, Leanna Oki. During all her years at the school, there has never been a club based on animal rights. This is Leanna‘s senior year so she thought it would be a great idea to get herself involved at school with something she is so passionate about. She was told by the student council that she could create her own club so she automatically took that opportunity and was able to find many others that wanted to be a part of it. She had her first meeting at the beginning of October and it has since grown from just 10 members to now over 50! Their first fundraising event was a huge success. 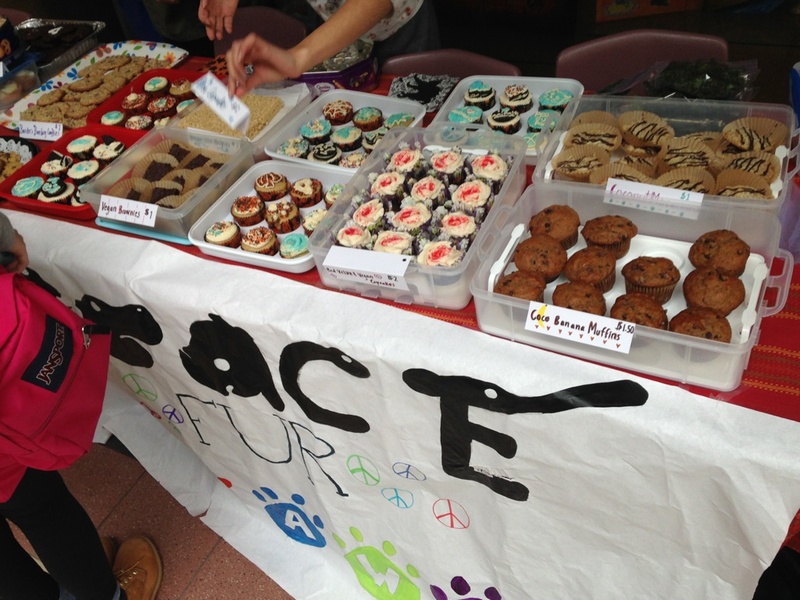 They held a vegan bake sale for the school’s club sign up day and they raised money and awareness for cruelty free food and fashion. They sold delicious home-baked goods including red velvet cupcakes, brownies, Rice Krispies, muffins, cookies and a ton of other treats. Out of all the clubs in the school, Peace Fur Paws gained the most donations and it was a true testament of what a group of dedicated individuals can accomplish, no matter their age. Now they are planning a bigger and better fundraiser in January to help jump start the celebration of the organization obtaining Nonprofit registration, and one of their goals is to raise money to sponsor a very sad circus lion to be transported from Peru to a U.S sanctuary. We hope we can help make that happen!